Preheat oven to 350 degrees. Grease two cookie sheets or line them with Silpat. In another large bowl, cream the butter and sugars. Add the water and vanilla. Mix the ingredients until they are just combined. Add the eggs and mix them lightly. Stir in the flour mixture. Fold in the chocolate chips. Don't over mix the dough. Bake them for 12 minutes or until the edges and centers are brown. Remove the cookies to a wire rack to cool. Yield: 4 1/2 dozen three-inch cookies. Chocolate chip cookies are Tate's Bake Shop signature item. They are thin and crisp and remain everyone's favorite. They sell thousands a week and ship them all over the country. This recipe came out of the, Tate's Bake Shop Cookbook by Kathleen King, the owner of the bakery. I compared the batch of cookies I made using her recipe to the cookies they sent me in the mail. The flavor and texture is exactly the same! Using this cookbook allows you to make bakery quality cookies, cakes, pies, muffins, and breads at home. 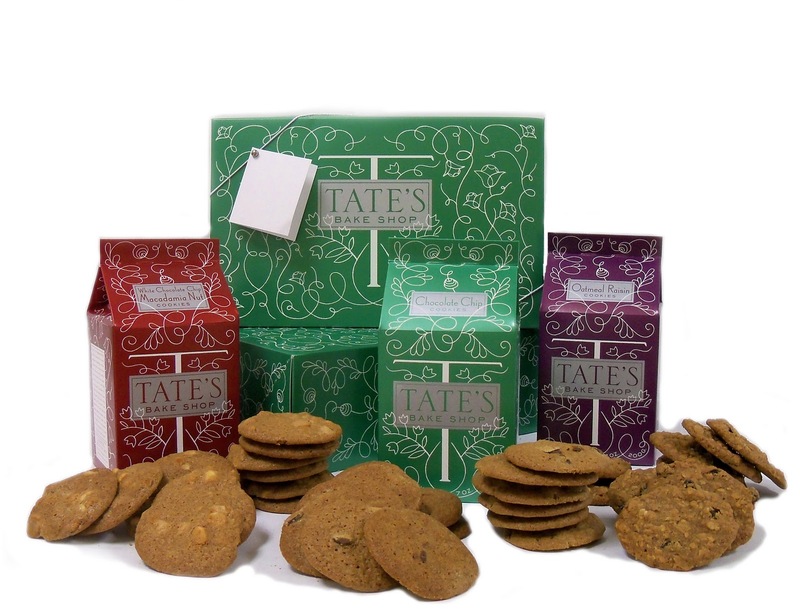 Go to their website: TATE'S BAKE SHOP and enter the discount code: "cookies" to receive 15% off of your order, now through December 31st. For your chance to WIN three boxes of Tate's Bake Shop Cookies and their Cookbook, check out my post about the Tate's Bake Shop Giveaway. Below are a few tips from Kathleen to help you achieve bakery quality cookies. Flour makes a big difference to the outcome of your product. Kathleen suggests you use Gold Medal all-purpose flour. Use a 2-tablespoon ice cream scoop. This will ensure the correct yield and bake time, and give you more uniform, professional-looking cookies. Always preheat the oven and wait for it to reach the correct temperature. Don't rush this part. Use a Silpat baking mats. They make cleanup much easier, and there is no added butter to the product. Silicon paper works just as well. Most of all, have fun! Don't take it seriously. If you screw up, don't worry about it-they're only cookies! When you enter the Tate's Bake Shop Giveaway, you are automatically entered into my monthly giveaway. Read my post about my monthly Giveaway for more details. Also visit my friend Pam's blog, Pam's Midwest Kitchen Korner, she is also hosting a Tate's Bake Shop Giveaway! These sure look wonderful; my chocolate chip cookies have oatmeal, these look so decadent, sweet, chocolaty and buttery; can almost taste them. Yum! Pass one to me please Linda! They are delicious for sure! I need to buy a Silpat now! These cookies look wonderful! I love chocolate chip cookies though, so I might be bias!! My family LOVES chocolate chip cookies, but I don't want to make them the same way every time. So I'm always looking for a new twist. Anxious to try these. Bookmarking them now. Thanks for sharing! I love the look of these cookies! So thin and crispy! Perfect! Hi Linda, First time to your blog, I'm delighted! I`m in the process of baking my Xmas gifts, so these cookies are now on the list, thanks a lot. I guess it's all about dark brown sugar, it sure makes a diference on the final taste. 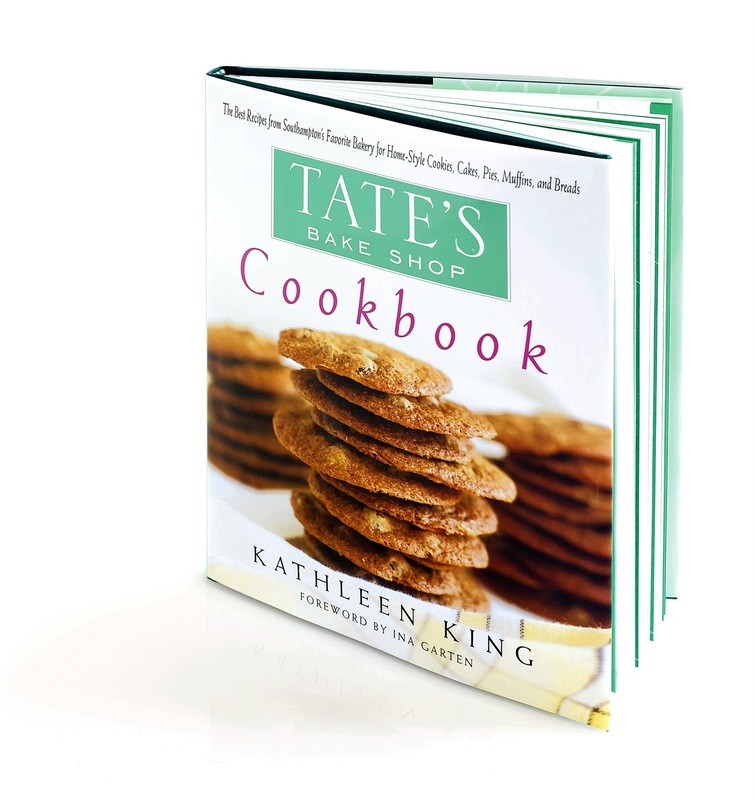 I just received the cookbook and cookies from Tate's - they were terrific. Your cookies look buttery, crispy, and decadent. Great treat for kids as well. Came back to thank you, I made the cookies this weekend: none left: the are amazing!! This cookie sound so great! I love a great chocolate chip cookie! These look chewy and crispy and wonderful. I noticed you used salted butter. Nice to see I am not the only one who does! Thanks for Sharing and linking up with us today! New follower from Share a Spoon :) chocolate chip is still probably my all time favorite cookie, and these look delish! Yummy!! Chocolate chip is always a big hit! This is a kind of cookie that I am looking for . The recipe is easy to make that I can surely tell that I can make this. LOL. I'm definitely craving for a plate of that right now. Thanks for sharing this wonderful recipe. This is definitely a must do recipe this weekend since I got my ISO 22000 Training. <3 your CHOCOLATE CHIP COOKIES & would've Never thought of them being Gluten Free! I'd bought them @ Huntington Hospital Gift Shop $4.99 a bag! My Kind of Delicious Cookie's! I can't wait to try these! Thanks so much for sharing! Egg Nog French Toast & Monthly Giveaway!